Incidentally -- and this may come as a surprise to the new Director of Elections in Watauga County, Matt Snyder, though we hope he knows by now -- but out-of-precinct voting and same-day registration & voting is still in effect and probably will remain in effect through the municipal elections in November, barring further court action. Now you'll have to pay close attention to understand why: That paragraph above is true because of a strange combination of federal court rulings in the voting rights case just completed in Winston-Salem. 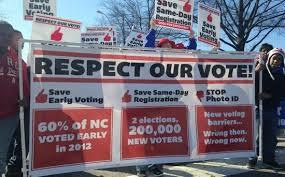 Early last October, the Fourth Circuit Court of Appeals (NC's own Judge James Wynn) enjoined the implementation of the ban on out-of-precinct provisionals and the repeal of same-day voter registration. Then about a week later, the US Supreme Court stayed Judge Wynn’s order. But in their stay the Supremes said that if they eventually denied certiorari to hear an appeal of Judge Wynn’s order, Judge Wynn’s order would go back into effect. So this April, the Supremes denied cert. At that moment Judge Wynn’s order sprang back into life, enjoining the end of out-of-precinct voting and same day registration. The effect was that the pre-2013 implementation of out-of-precinct and same day sprang back to life. For a judge, or a gross of Yer Honors, to change that again before the voting begins this fall would throw even more people into chaos, though it could happen. Bottomline: Mr. Matt Snyder had better be ready to allow out-of-precinct voters their ballots and to register new voters during Early Voting on the spot. I guess it is not a secret any more, thanks to Watauga Watch, lol. This is the way this whole voting thing is going--keep everyone guessing and confused so even if (or maybe for sure) people are following the news they won't know what the rules are and will be discouraged from even bothering to vote.